This is my pattern for a very simple but beautiful striped blanket which has oodles of surface texture and a lovely dense feel. Despite the complex look of the stitch pattern, I promise you this is very easy crochet using two simple stitches to create a series of stacking shells. 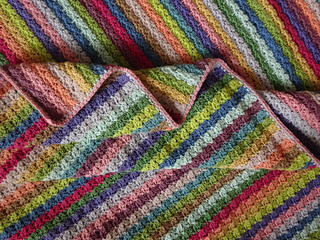 I would go so far as to say this is one of the easiest patterns I’ve ever come up with which makes it a perfect project for beginners embarking on their first blanket journey, or for those of us who really, really just love to zone out a little whilst working up some easy, rhythmic rows of colour. ♥ If you crochet loosely, you will need to make sure that your starting chain and first row measures roughly 120cm otherwise you will need more than 15 x 100g balls. It’s fine to reduce your starting chain to achieve the correct size, just remember to make your starting chain a multiple of 4, plus an extra 2. ♥ If you wish to make the blanket bigger ie to fit a double / king size bed, you will need to increase the number of stitches in your starting chain…..the starting chain should always be a multiple of 4, plus an extra 2. You will also need to purchase extra yarn if you make a bigger size.